Were my head not screwed on, I’d likely have lost it in the course of the last couple of weeks. I’ve lost just about everything else, from my driver’s license to my tax card to my tin opener. I thought I’d lost a bush that had been planted outside my front door but one of my neighbours took pity on it (or me) and did some triage. It might survive. The Irish licence I can salvage; it just means spending a day when next I’m home reading a book (an entire book) as I wait in line at the Motor Tax office, after having one of the local Gardaí sign my photos saying that he knows who I am. Replacing my tax card I can do by post. Replacing my resident’s card will be a little trickier. But first on my list was my address card (Lakcím kártya) … and I was dreading it. I’d taken advice from the ever-so-helpful team at Everyday Solutions, a genius venture set up by a team of young entrepreneurs here in Budapest to help non-natives navigate the country’s maze of bureaucracy and find everything from a plumber to a butterfly tattoo. The charge? A donation of €5. At the same time, I emailed another company in the market that helps expats abroad and they were happy to go get my card for me – no need for me to be there at all. I was tempted. So very tempted. 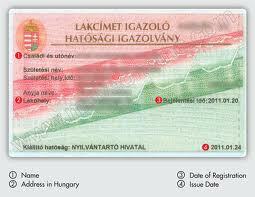 I break out in a cold sweat at the very thought of interacting with Hungarian bureaucracy. I know personally how much is down to fine print and personal vagaries. And if I could keep out of it and pay someone else to feel that pain, then great! But when the quotation came in at 29 040 huf + VAT (about €95 + 27%) … I decided that I needed to explore my options further. I think of everything in terms of travel – and for that sort of money, I could fly to Dublin, one-way, next week, or take the train to Prague and stay overnight! So I phoned a friend for directions and then asked another friend to come with me to the local municipality office, about a 10-minute walk from my flat. The chap at the door gave us a number. We waited for 10 minutes for it to be called. And 15 minutes later I walked away with new address card at the cost of 1000 ft (€3.50). I was home inside an hour. Not for the first time I wonder at the cost of being a foreigner living abroad who doesn’t speak the language properly. And not for the first time I’ve resolved to get to grips with the dreaded Magyarul. Massive thanks to all involved… next stop, immigration. I heartily approve of this newly-rediscovered resolve! Jó tanulást kivánok. Hi Xin Yan… I just had to show that I was still living in the same place and show my passport. It was on file so they just printed out a new one. You pay for it there and then so no need for the post office stamps. I used the contract for my flat as proof.